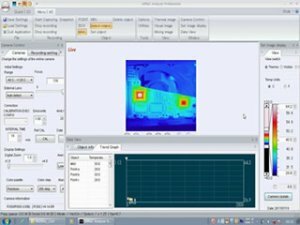 The InfReC Analyser NS9500 Professional is a high-function software that can perform real-time measurement, analysis and report output of thermal images and visible images. Camera control - Remote control such as focus adjustment, selection of measurement temperature range, calibration execution etc. is possible from a pc. Real time image display & recording - Display thermal images, visible images, composite images (R500 / R300 only visible / composite image display possible) in real time, and simultaneously recorded on pc (HDD). Real time measurement - Measurement points (maximum of 10 points), maximum / minimum / average temperature in BOX are displayed in real time. Real time display of trend graph during measurement. Trend data can be output to a CSV file. Screen customisation - Register frequently used command menus in the tool bar, customise the display and position of the operation window for ease of use. Report output - Excel, Word template thermal image / visible image / graph freely layout report output. With the report editing function, it is possible to change the thermal image display setting (thermal image, graphic setting) on ​​the report. Product composition - Installation disc (CD-ROM) Instruction manual, including installation manual, license agreement, user registration card. Microsoft, Windows, Word, Excel are registered trademarks of Microsoft Corporation in the United States and other countries. Product names mentioned above are trademarks or registered trademarks of each company. *8 The IEEE 1394 driver of the conventional product (online software) cannot be used. It is necessary to update to the driver attached to this product.